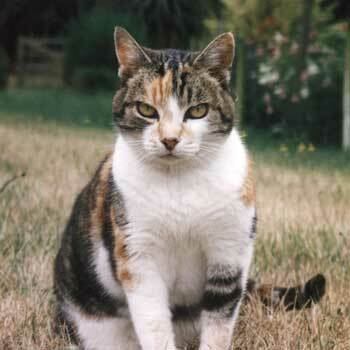 Lucky was a white, ginger and black splodgy cat who retired to live here with us when her owner went overseas. In many ways she wasn't really very lucky. She was hounded and tormented by the two grey sister cats, who were a formidable tag-team. She even had to stay inside at nights so she wouldn't get beaten up by them. Lucky spent most of the daytimes cat-snoozing in the stables - that was her patch. She rarely moved to other parts of the garden. It was nice gardening near the stables, as she'd always turn up to keep me company, first checking that the grey sister cats were nowhere in sight. After two years with us her name let her down. She started getting sick and then made her final trip to the vet, dying of a cat-cancer. During her short time with us Lucky was much fed and much loved and we still miss her. There is a rose in the driveway border called The Prince under which she is buried. Even now she isn't lucky as her rose keeps getting strangled by Clematis and smothered by Agastache.